Robbie was born in Pretoria in 1963. Robbie's creative skills were evident from an early age, when in Grade 2 he was asked to produce a drawing for which he received a gold star. He decided then that he wanted to be an artist. After school he studied fine art at the Cape Town Tech majoring in sculpture. He was only able to afford the fees for two years before he ran out of money and had to find himself a part time job in Pretoria. He completed his final year at the Pretoria Tech in 1988. He embarked on a career as a full time sculptor because of his love of three dimensional works. 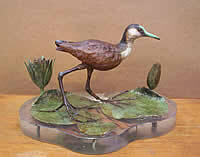 Robbie works with different mediums specializing in bronze, silver and stainless steel. He enjoys tackling difficult and technically demanding compositions. He likes to combine different mediums as well as inlaying semi-precious stones into his compositions, such as tourmalines and garnets. He pays close attention to detail. Robbie has a passion for wildlife, especially birds and spends many hours studying their form and muscular structure to be able to capture movement and diagnostic characteristics. This can be seen in the subtle expression and gestures of his compositions. Robbie works mainly on a commission basis; working closely with his clients so as to create and sculpture that pleases and satisfies them. His work is represented in private collections in South Africa, Britain, Switzerland, Germany and the USA. Robbie has two well-placed and known public commissions - the 'Dig Man' at Wits University and the life size bronze of a dolphin mother with her calf in the traffic circle Plettenberg Bay's main street. In the 1990s a sculpture of Robbie's fetched the highest price achieved by a contemporary, South African wildlife artist at Christie's prestigious wildlife sale. Robbie submitted a bronze water feature of a life sized hippo head with an estimate of between � 000 - 6, 000 which fetched �, 000.